Everyones favorite digital friend Siri can improve your music experience and song recollection by retrieving song lyrics for you. 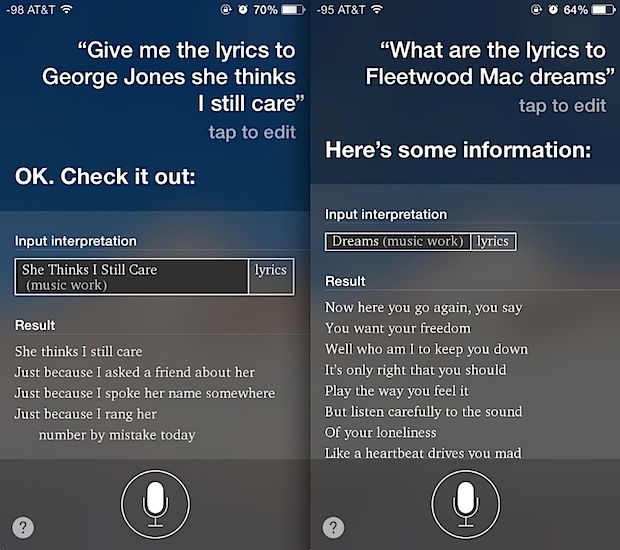 Whether you’re aiming for some spontaneous iPhone based Karaoke, looking to settle a dispute over what an artist is saying, wanting to add some lyrics to a song that is missing them, or just wondering what the lyrics to a given song are, Siri doesn’t care, anything goes. For example, “what are the lyrics to Peter Gabriel San Jacinto” or the shorter “Lyrics to San Jacinto” will work just fine. Though you can sometimes request lyrics just by song name, if there is any ambiguity between the song or artist, or it was covered by multiple artists with differing verses, it’s best to specify both the song and artist name. The lyrics that are retrieved successfully by Siri will come through Wolfram Alpha, like many of the specific data inquiries, funnier requests, and other actually useful commands that you can request through the agent. Clicking through any of the links that Siri brings back will open a new Safari page with the URL specified by Siri. 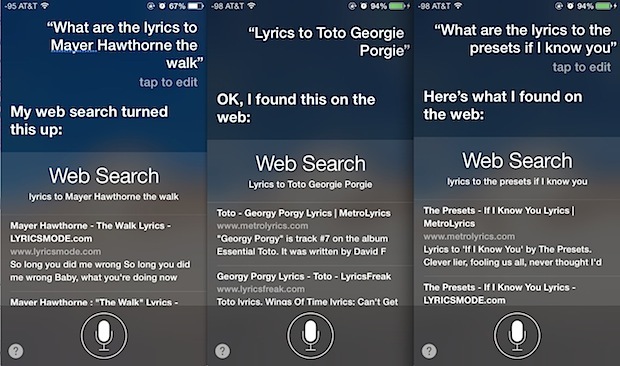 While this usually leads to the proper song lyrics for the song you’re looking for, it’s a little disappointing that Siri can’t relay them without clicking through to a third party URL, particularly since many lyric collection sites are rubbish (MetroLyrics seems to be OK, for what it’s worth). Presumably, as Siri gets smarter and learns more, or perhaps with a new licensing deal, that won’t happen in the future though. But can the songs lyrics be imported into songs on the iPhone? George Jones buddy! Yea git ‘er drawl Siri! I need to get lyrics on my iphone. I will check sifi and recommend it to my frds if i like it.